Your children, as they grow, acquire more and more toys, books, and friends. Soon you find that there are sleepovers and playdates on the weekends and all summer long. Because they’re growing up, your children and their friends don’t really want to hang out in the living room or kitchen anymore. Instead, they’d rather be in your son’s or daughter’s room. 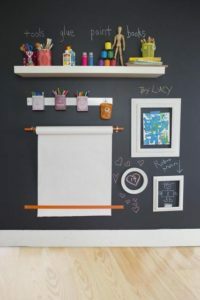 Chalkboard paint on closet doors (or walls! ): Who doesn’t love coloring on things? Remember when you sighed at the thought of having to wipe off the crayon from the wall when your little one when on a coloring spree? Well now they can do it without the repercussions they once faced. Pick up a can (or two) or chalkboard paint and paint it on the closet doors or even on one of the walls. It’s a great way to let the kids express themselves and be artistic on a larger scale than they’d be able to do on paper. 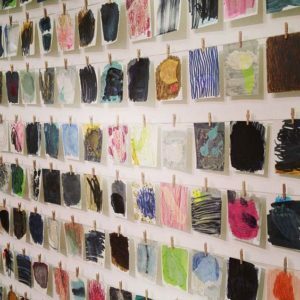 Wire or string and clips to hold art projects: If you’ve got an artist on your hands let he or she display those beautiful works of art with some wire or string and clips. You can hang the wire across the wall and give them clothespins to hang up paintings and drawings. Plus, this is a great way to let them be proud of their work! 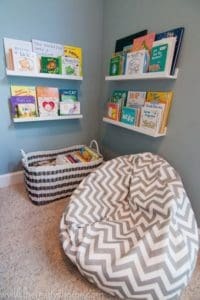 A bookshelf full of their favorite books: In a time when it seems that kids just can’t take their eyes off the television, tablet, or phone, installing a shelf full of their favorite books may encourage them to pick one up and read once in a while. Or, if your not-so-little one loves reading, you can give them that little reading nook they’ve been asking for for what seems like forever – bookshelf included. Repurpose old furniture to give them storage for their belongings: Give new life to old furniture when you repurpose it for storage in your child’s room. 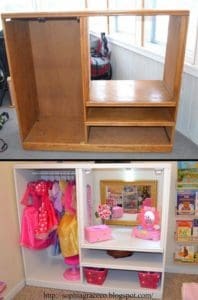 They can use an old dress that’s been transformed into a locker to hang up sweaters and coats or you could take an old television stand and turn it into a dress-up station for their dolls!